Gastroenteritis is caused by an infection, which is usually viral. More than 50 per cent of under-twos with the condition have been infected with a rotavirus. 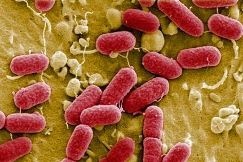 Bacterial causes are less common, but tend to be more severe and include Campylobacter, Shigella and E. coli infections. The infections are transmitted through contact with an infected person, poor hygiene and contaminated food or drink. Gastroenteritis affects all age groups, but is particularly common in the under-fives. Small babies are especially at risk from dehydration. If the child is dehydrated you may notice a dry mouth, sunken eyes with no tears and/or a sunken fontanelle (the gap in a baby's skull). Babies may also pass little or no urine. For mild gastroenteritis in older children, encourage them to drink plenty of rehydrating fluid (from the chemist) or unsweetened fruit juices. They should also eat as normally as possible. Light foods such as soup, pasta, rice and bread are often better tolerated. In breastfed babies, continue with normal feeds and give rehydrating solution as advised. In bottle fed babies, continue with normal full-strength feeds if possible and use rehydrating solution as advised. Get medical advice for small babies, children who seem very unwell or dehydrated (dehydration can be difficult to assess, so visit your GP if you're at all worried) or if the gastroenteritis doesn't settle in a day or two. In severe cases, hospital treatment, including intravenous fluids, may be needed. It's important to rule out conditions that can be mistaken for gastroenteritis. Most cases settle rapidly, but the child may be infectious for some time, so be particularly careful about hygiene after a bout of gastroenteritis. Some children get persistent watery diarrhoea due to damage to the intestinal mucosa and temporary lactose intolerance. Returning to rehydrating solutions for 24 hours usually solves this, but occasionally it may become chronic and require expert help.